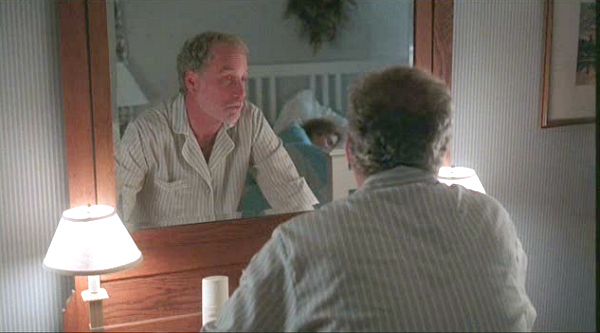 The 1991 comedy What About Bob — starring Richard Dreyfuss as a psychiatrist whose vacation is interrupted by a patient named Bob (Bill Murray) — was pretty funny. 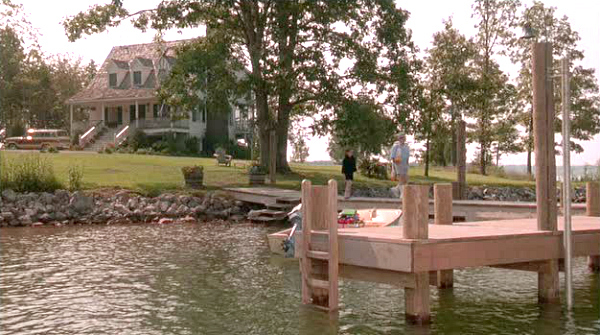 But what most of us probably remember is his vacation house on Lake Winnipesaukee, right? They filmed inside a real house in Wirtz, Virginia, which went on the market recently. The (real) house sits on Smith Mountain Lake. The house had lots of cheery green paint on the exterior trim and shutters. 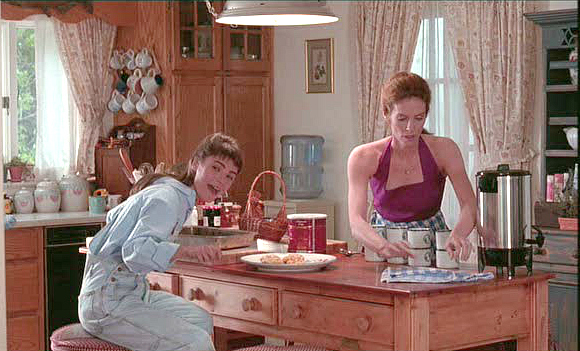 Julie Hagerty played Dr. Leo Marvin’s wife Fay and mom to Anna and Siggy–even though in real life she was only 10 years older than the actress playing her daughter (Kathryn Erbe). Dr. Leo’s family falls in love with Bob–they think he’s a lot of fun, even if he does leave a trail of chaos in his wake. Leo, however, resists his charms. The puppets on the mantel are mini versions of each family member. When they’re having problems, Dr. Leo likes to use them to act out their issues, which the kids don’t really appreciate. The screened porch run across the entire back of the house and is where the family eats all of their meals overlooking the lake. 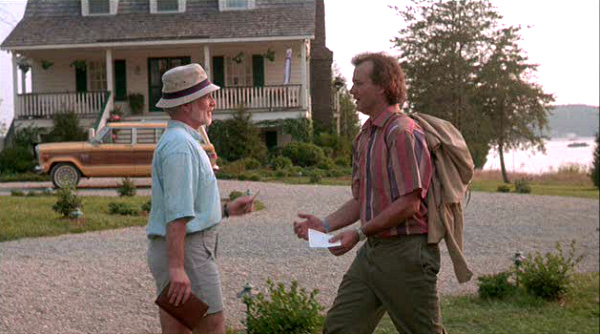 In this scene, Bill Murray is wearing a “Don’t Hassle Me, I’m Local” t-shirt. A reader tracked down these listing photos. (Thanks, Shelley!) It has already sold, but we can see what the house looks like today. The house has 3 bedrooms, 2.5 baths, and 2,880 square feet. Wow — they are in serious need of an interior decorator there! I loved the screened porch, though. I want one. It really would be wonderful if we could see what the new owners do to improve this property, Julia. The house is a gem, sitting so pretty in that lakeside setting. 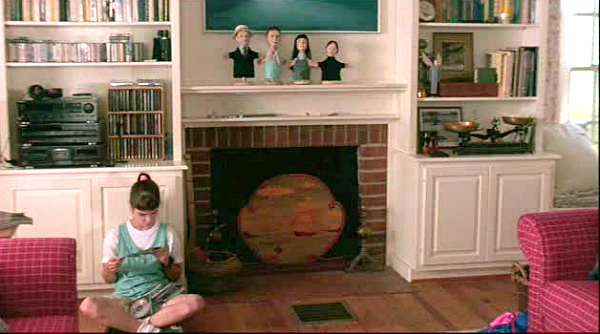 I remember watching the movie and picturing our family living there. What the heck are you talking about Janelle? The decorating in the home is timeless and gorgeous!! All of our family loved that movie and my favorite character in it was the house! Thanks for the update, it was great fun. Great post! I watched this movie in health class in 10th grade and loved it. I especially loved Bill Murray’s character. I didn’t realize Richard Dreyfuss was the guy in “Close Encounters of the Third Kind” until I watched this movie a second time. It’s fun to see him play a different character. I love the house and like how the tv set is pretty much the same as the real house. I actually love the way the house looks today and I wouldn’t change a thing. I too would love to have a vacation home on a lake or ocean somewhere. It would be so peaceful. Thanks Julia. This is one of my favorite movies, I always love to see the inside of movie houses. Glad to know that the house was actually used, it must have been a fun time for all….maybe not for Murray and Dreyfus?…. Wow! I can’t believe you featured this house! 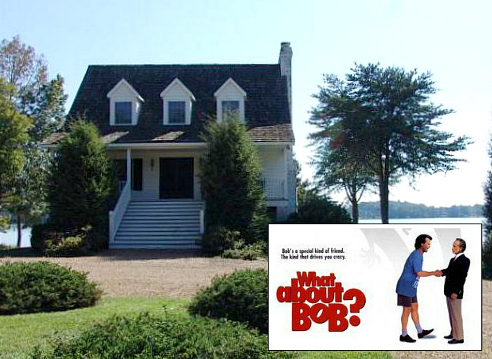 We (my family) love this movie, as we’ve been vacationing at SML for years, and we actually have a house literally right down the street from the What About Bob house. The house has had a great deal of work done since the movie. Sadly (or not sadly, depending on how much you like the movie I suppose), the dock is no longer there. During the remodel they built a newer, bigger dock. Also, I believe the house’s address is in Moneta, VA. I could be wrong though. County borders are weird due to the lake being a relatively young man-made lake. No kidding? How fun that you live near the house. I didn’t know about the dock–I didn’t see any photos of it in the listing. Thanks, Grant! I love that movie, one of my favorite fun ones! Adored the screened porch as well! Julia, come and join my new amazing giveaway by Splenderosa! I love this movie but I love the house even more…I cried the first time I saw they movie and it blew up…Thank you for sharing this post…I enjoyed seeing what it looks like now. That was a funny movie! The house is cute, but you are right it doesn’t seem that big. Did you have a good weekend? I hope you did… I was thinking to ask you about your puppy. How is it doing? Are you kids loving having a puppy? 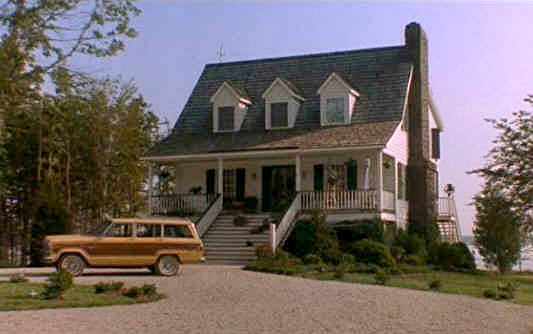 I have always loved seeing this house in the movie! I love the house at first sight and I do really like the exterior, but I hate the inside! What about that living room with that hideous rug and those red couches! Brr. I would like to live there though, I think I could transform it easily into a really nice place. Love the view by the way! I loved this house from the moment I saw it! 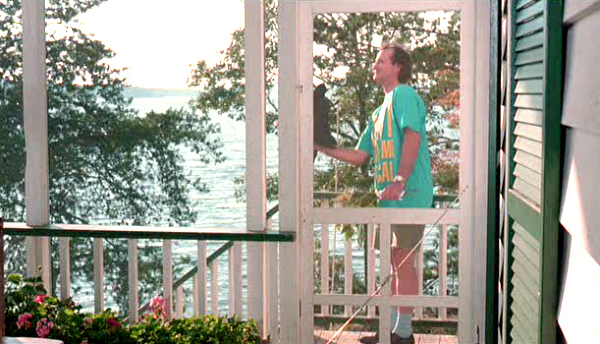 The double doors are wonderful…we still joke about Bill Murray’s mmmmmm throughout the meal! I go mmmm as I look through your post! It looks like the kind of place that you can kick off your shoes and put up your feet . Very L.L. Beanish isn’t it? 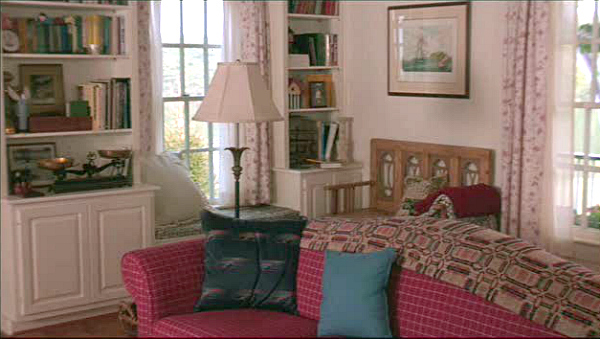 The bedrooms look like they came right out of the pages of their home furnishing catalog. I think we had the same tile in our kitchen in the 80s. A good reminder that colors are trendy and best be used as accents rather than installed as something permanent (and costly to replace) . I liked the green exterior trim better than the black. The quintessential New England Cape Cod colors, but then maybe I’m prejudiced because that is how my house is painted. Okay Julia, I had no idea this is really at Smith Mountain Lake…45 minutes from me!! I’ll have to go snooping! One of my all-time favorite movies! DR. LEO. MARVIN!!! Love these pics! That is a beautiful place and was a great movie setting! I do love the old Wagoneer that was in the movie also! Thanks Julia!! I LOVE this movie, and always laugh the whole way through! And I’m with you, the screened in porch is my favorite part! I love the house, but the red and yellow rooms? Not so much. Would love to see what the new owners have done. So much fun to see. This was a favorite movie for my family. The girls were young, but, old enough to enjoy it. To this day, a bit into a good piece of chicken will have one of my adult daughters exclaiming “scrumptious, Fay”. Such a beautiful house. Wouldn’t mind having breakfast there everyday on the screened porch and then go out with my boat which is moored at the dock. Sigh..
I’ve lived in Virginia my entire life and always heard about the amazing Smith Mountain Lake. I need to find a friend who owns a house there so I can visit. sigh. I loved that movie! 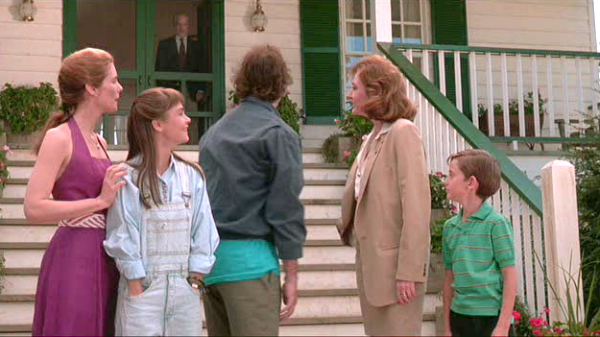 Such a classic comedy, and the vacation house is idyllic. I’m a fan of porches and the screened in back porch is perfect ! I too would eat every meal outside in this porch-all the benefits of dining outside without the annoying bugs! 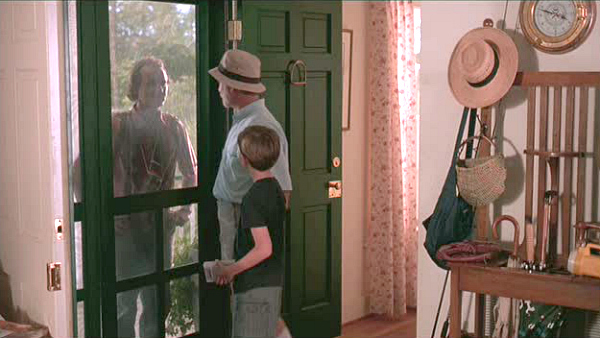 It’s cool to see the changes of the house from the movie to present day. I think I like the green trim better! Now if you’ll excuse me, I think I need to go buy one of those hilarious t-shirts. Thanks for the link Julia! Happy Monday! Thanks Julia for this post, every time I see this movie, my favourite character is the house, of course. Iwould like a house on the lake like this!!! Thanks for posting this one I enjoyed it. Not crazy about the inside but I love the charm of the exterior. I hated to see that they painted the brick around the fireplace…Why do people do that ? Loved that movie although I wouldn’t mind at all to have Bob as a visitor…. I must be a rarity because I hated the movie–it made me feel so uncomfortable watching Murray and Dreyfuss interact. 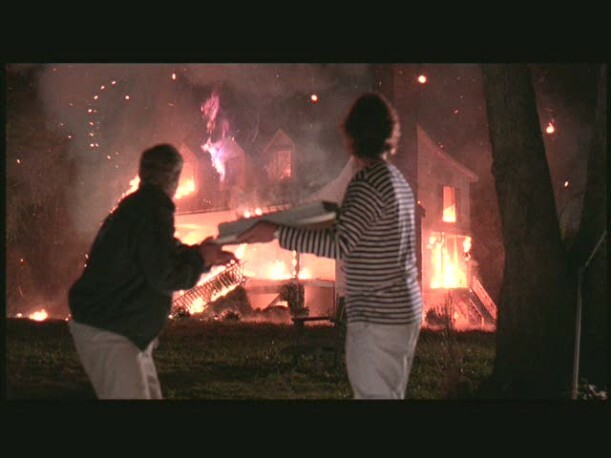 And when the house blows up at the end, it cemented my dislike. But I remember thinking what a beautiful house (pre-explosion). Thanks for sharing something lovely. It makes Monday just a little bit brighter! Julia, how ever do you get all this information and the photos? I actually remember this movie but at the time I was not paying a whole lot of attention to houses. Now when I watch something I’m more likely to notice the decor than anything else! Loved this movie, thanks for posting, Julia. It’s still a cute house, the yellow walls and white trim look cheery, but agree the red sofas are a bit much. Also prefer the green trim, awesome screened porch. Now I’ll have to track this movie down and watch it again! This is one of my favorite movie houses. 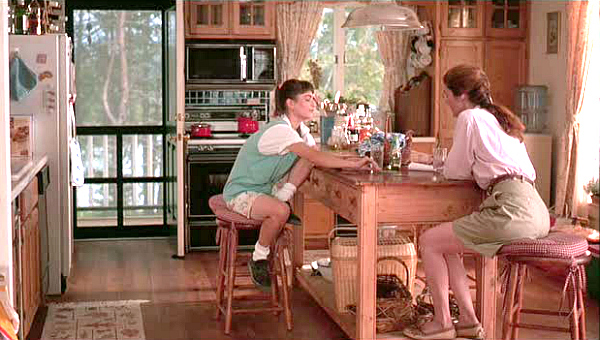 It is still as cute and charming as it was in the movie. Great post, great movie! Very interesting to see how the house has and hasn’t changed. Smith Mountain Lake is a beautiful place to live and film a movie!! Where is the unseen bedroom that Anna slept in? I’ve loved this article, also. My entire fam, extended fam included, can recite every line in the movie. We’ve seen it hundreds of times, and will probably watch it a hundred more times. 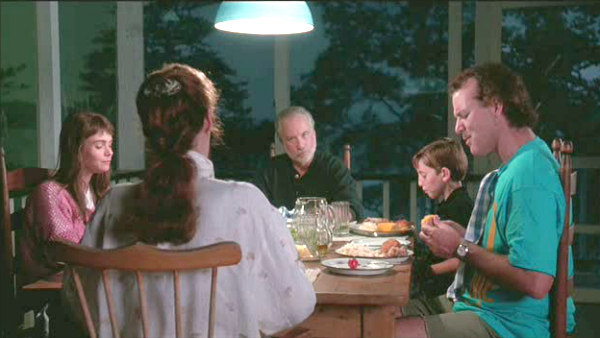 Our family vacationed at Smith Mountain Lake the summer they filmed it, and stayed at the resort all the crew stayed at. You couldn’t get close to the house then, but the next summer we drove our boat over there. We saw the screened in porch, the bell, the dock, the outside shower, and the whole house. It was gorgeous. It was a rental for awhile, and I wish we could have stayed there. Thanks again for showing the pictures. Now I think I”ll watch it again! Siggy: “What’s left to worry about?” Bob: “Well, not diving anyway”. What a great film! Murray really captured the multi-phobic personality and though his transformation to “okay” enough to appear on “Good Morning America” and endear everyone BUT his therapist (actually NOT as uncommon as people think! ), was rather fast, it’s the movies, so…hey. 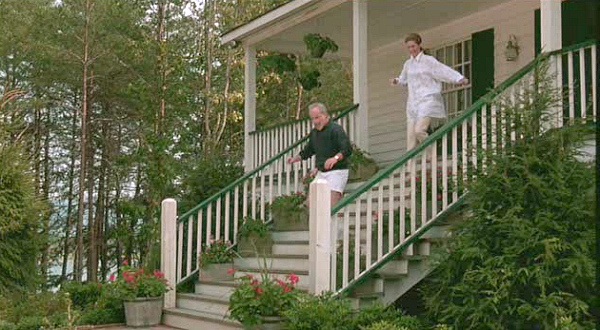 Being a New Englander, and someone who hung out at Lake Winnipesaukee as a teen, I was annoyed to find they’d filmed it elsewhere (as with the Catskills in “Dirty Dancing”, filming it at Lake Lure in N. Carolina) and if you drive through the Weir’s Beach and Meredith, NH, you won’t see TOO many designer-decorated houses! They’re much more low-key and functional…and there are more trees near the water. But that’s not what the film was about. The real message that someone totally missed above was how screwed up so many shrinks actually are! 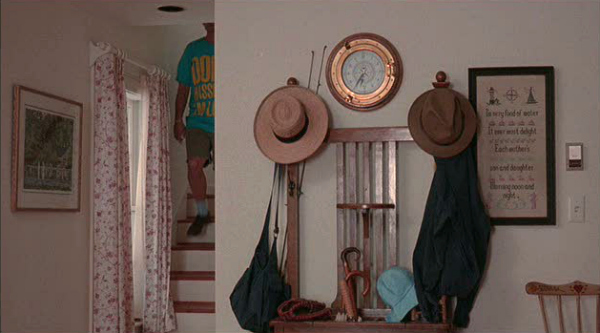 Someone as vain and concerned with appearances as Dr. Marvin might really have had a house like that. And sometimes, their clients are really the sane ones. 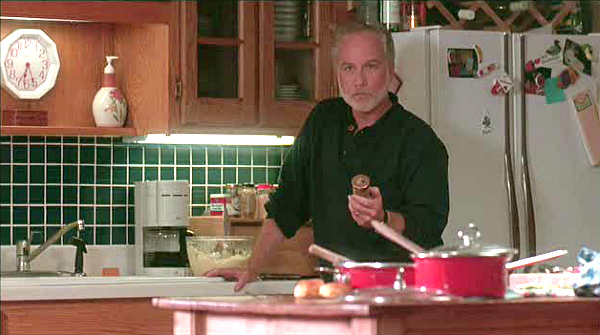 Bill Murry (as always) was amazing, and I fell as much in love with “The Fam” as Bob did, no matter what kind of house they lived in. We own a lake house just across from this cute place. You always hear people say ” come on up it is beautiful up here”, and people probably pay no mind. But let me assure you SML is heaven on earth. We watch the movie frequently with guests and always take a ride over to show them the house. It is so laid back here deep in the woods of Va. and we are all country folk. Like Bob said Yall is in our everyday vocabulary. Everyone is friendly as the lake has slowly grown commercially with extremely expensive homes,but you can turn the corner and be just as happy in a “trailer park” if you will. If you get a free weekend, YALL come on down and see us. I remember that house being swooningly gorgeous when I first saw the movie… I was young, broke and house-hungry at the time. It doesn’t quite look as scrumptious as I remember, although the What Lies Beneath House is still fabulous to me.